In every city there are several companies that do hardwood floor installation. Almost all stores that sell hardwood and laminate flooring have their floor installers. Does this mean that for those who want to be in this line of work, there is no chance of success? Of course there is. Moreover, there are good reasons why you simply must not be only a floor installer, but also the master, if you have a strong desire to be so. The first reason: If you are a creative person and you enjoy working with wood in your spare time, then you are on the direct road to hardwood floor installation. 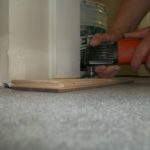 Of course, there are certain rules of hardwood and laminate floor installation that you have to learn. But believe me, there are situations where no rules apply and you will have find the way out yourself. And you’re sure to find it! Thanks to your creative thinking, for you man, there is every chance of success for becoming a good craftsman. The second reason: If you desire your work to deliver joy and pleasure to others, then you owe it to yourself and them, to become a master of installation! From doing your job well, you will see many happy faces and receive many words of thanks from customers. Some of them will even give you presents, upon completing the project before Christmas. The third reason which is purely masculine: As a rule, men always rush. They do not like monotonous action, though of course there are exceptions to the rule. Men like work that gives almost instant results. 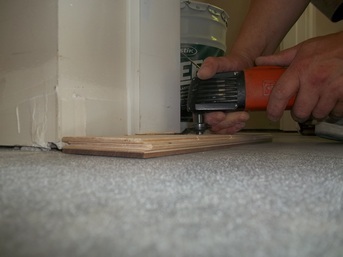 Having learned to lay hardwood and laminate flooring, you will see how much pleasure you get from your new skills. In addition, the amount of work will increase day by day, as experience and speed improve. The fourth very thorough reason: Hardwood floor installation will increase in pay, although you already have learned much and have several years of experience. Pursuing this profession, a good installer is always in demand. He receives orders more often than the usual installer. The speed and quality of his installation is much higher, but due to his gained skills, he is less tired. The size of the projects obtained will be very different from the projects of a regular floor installer. They will also be very different in the rates received for certain types of work. Want to earn more? Become a master! The fifth reason: If you are a beginner floor installer, you will grasp any job you can get, but the master gets to choose his job. That is, the master always has a choice – what kind of work he wants to take on, and which ones he wishes to refuse. The sixth reason: The beginner or little experienced floor installer is always looking for someone he can ask about how to make this or that work. But everybody comes to the master and consults with him. Whom would you choose to be? The seventh reason: If you’re striving to get this job only because through it you can make good money on hardwood floor installation, then you are mistaken, because the reason is much bigger. Thanks to the knowledge and experience you will gain, you will be able to broaden your skills and become the indispensable man, participating, for example, in home renovation, even your own.